The wireless technology for short range has established. 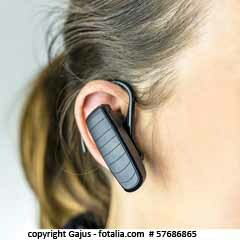 Striking are Bluetooth applications especially in the wireless headsets. Meanwhile often seen: a guy or girl wearing a small device such as a clothespin on the ear. The mobile phone is in your pocket or hanging on the belt. By radio application, the speech is transmitted to the handset. Initially, the communication between devices was the focus: wireless mouse and wireless keyboard found their way into the office world. Always new applications in the meantime occur: industrial automation, communicating with each other play equipment, alarm systems, wireless headset or hands-free kits in cars. Meanwhile Bluetooth modules are integrated for the hands-free function even in cordless phones DECT-standard. Originally put the industry on infrared technology in the near-field. The disadvantage of the infrared is based on the required line of sight between two devices. The radio technology, however, can also penetrate walls. Depending on the selected transmission power of one milliwatt (mW) up to 100 milliwatts, ranges of up to hundreds of meters are possible. The transmission technique is relatively robust. In the frequency range 2402-2480 MHz frequency hopping is performed. The system does not require registration at the Federal Network Agency. Bluetooth can transmit both voice and data. Disorders are by other radio applications possible: WLAN and microwave ovens also use the radio spectrum between 2.4 and 2.5 GHz. Smartphones and Bluetooth will replace the conventional technique of hands-free devices in the car. So far, the car phone was permanently installed with a lying outside the interior transmitting and receiving antenna. Electromagnetic fields were relatively small. The disadvantage of this is that the user was not accessible via the car phone number during the time outside the vehicle. He therefore needed another mobile phone. While voice mail and call forwarding was possible, but SMS’ were not forwarded. In modern vehicles now serve as hands-free car radio. It integrates the mobile phone via Bluetooth in the communication. The electromagnetic problem arises in two ways: on the one hand, the mobile phone will work in the interior with high transmission power, as no external cable antenna is led outdoor area. On the other hand arises from Bluetooth itself a high-frequency load which depends on the transmitted power. An immission from 50 to 300 µW/m² is to be expected. This double burden arises naturally when making phone calls on a wireless headset. In the vehicle it is reinforced by the shielding effect of the body.